SAFECO Corporation provides insurance coverage to a wide range of individuals and businesses. 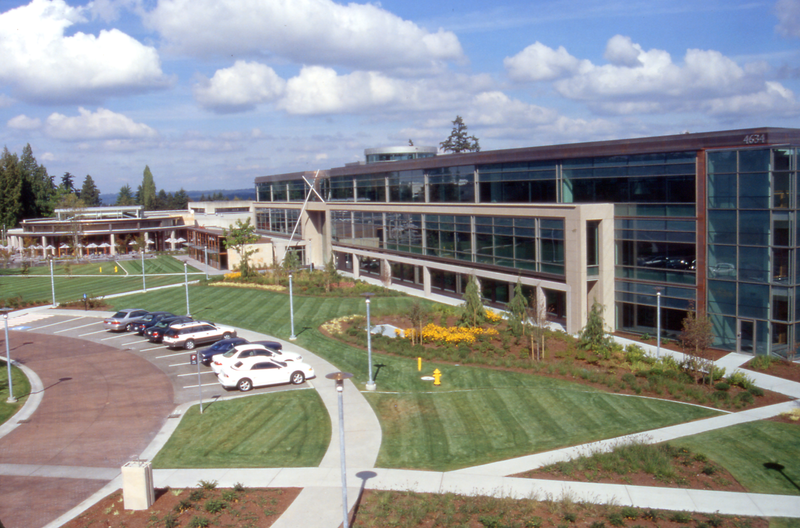 Its new campus in Redmond, Washington includes park-like grounds and several buildings. 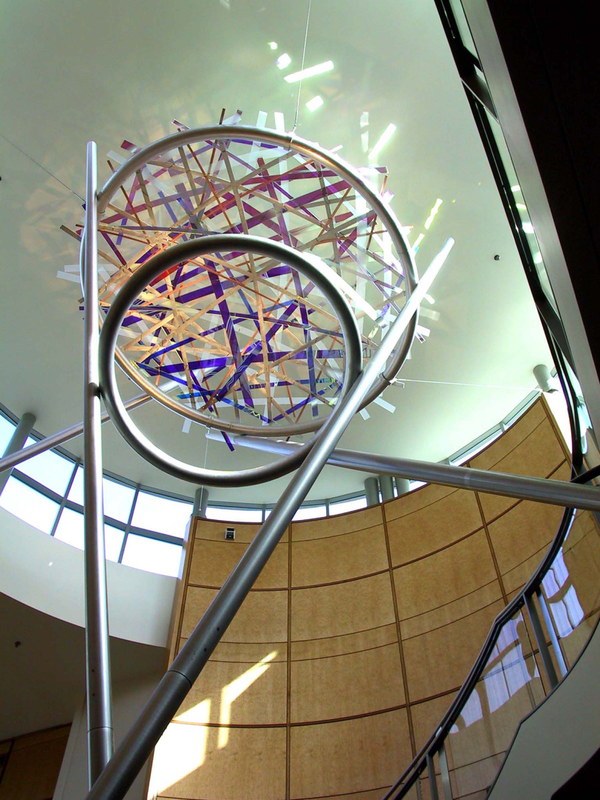 Ed Carpenter was commissioned to create a sculpture for a stairwell rotunda in the entrance to the main building. This installation reinforces the procession through the building with careful placement of minimal linear elements in space. 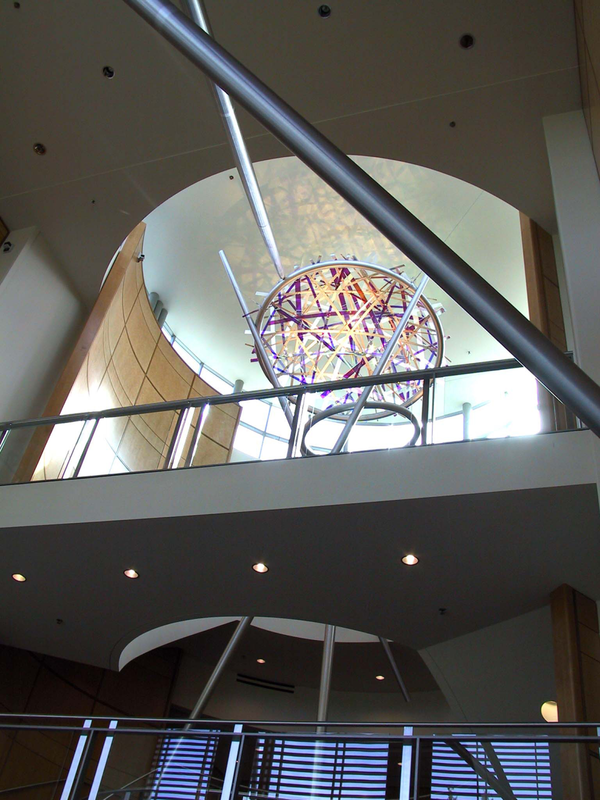 It uses the ceiling of the rotunda as a receptor and reflector of colored light. 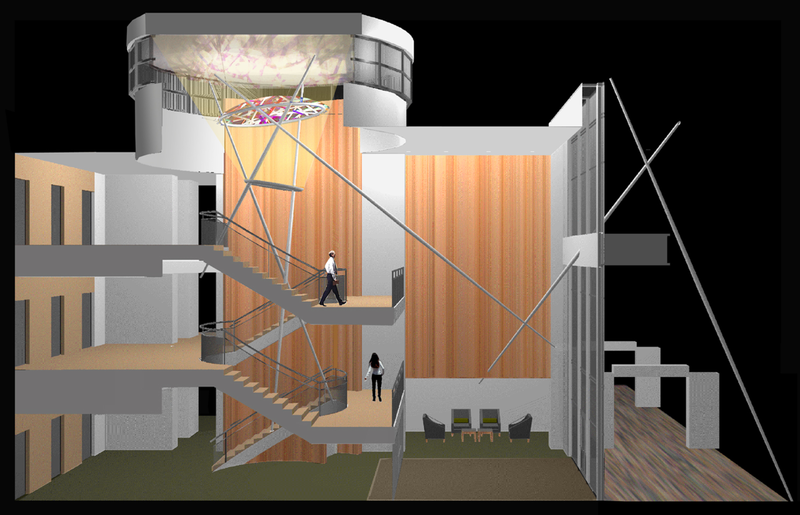 Beginning outside and developing inward, the aluminum mast elements lead through the outer lobby and into the rotunda, providing counterpoint to the architecture and a sense of movement. In the stairwell they ascend through two rings, the lower and smaller of which (the “light ring”) supports tiny spot lights. 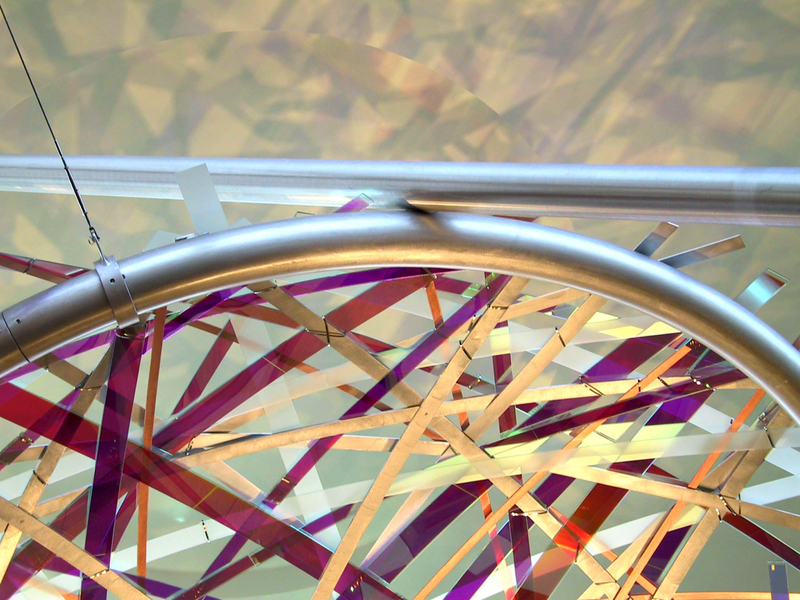 These are directed upward at the second and larger (the “lens” ring), over which are bent strips of copper, aluminum, and various types of tempered glass. 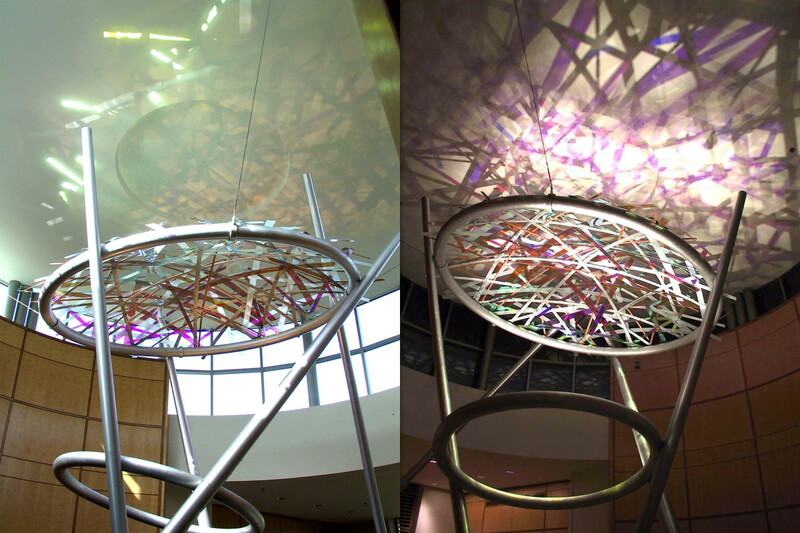 The light projected upward is filtered into subtle colors by the lens and is cast in broad patterns across the ceiling. The light reflected downward plays off the stairs and walls, creating intriguing volumetric and atmospheric effects. A programmed controller is employed to create constant subtle changes in the light projections. 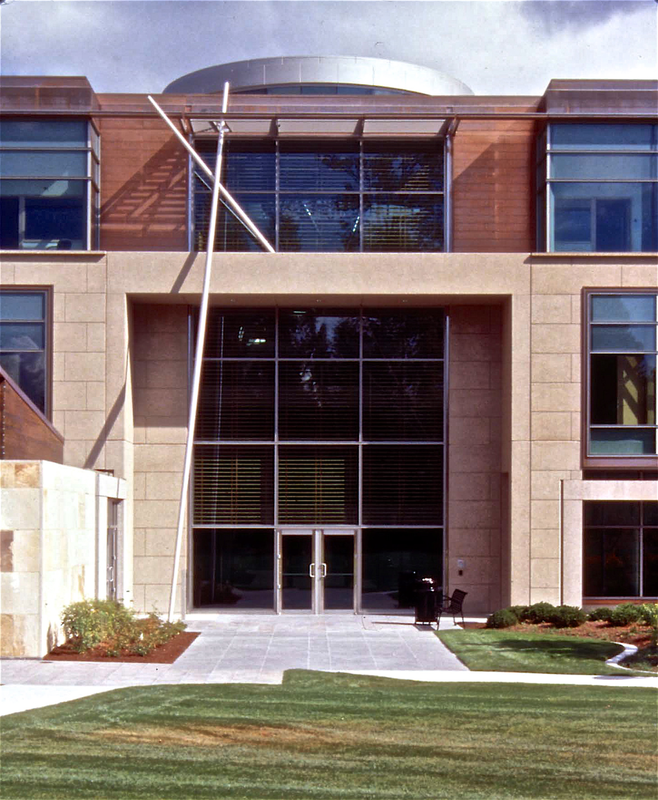 Materials: Aluminum masts; aluminum "light ring" and "lens ring", aluminum and copper flatbar, tempered dichroic and etched plate glass, stainless steel cables and hardware; steel anchors and architectural attachments, and programmed lighting.